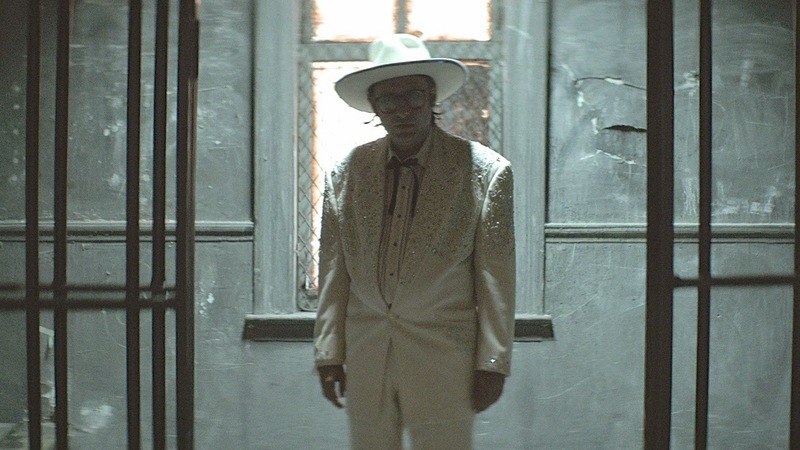 Rick Alverson's Entertainment is perhaps the most bizarre film of the 2015 Sundance Film Festival. Melancholy, disturbing, and occasionally unwatchable - it somehow lingers with us allowing its bleak sadness to continue to haunt well after watching. Entertainment follows a vulgar and broken down nameless comedian (Gregg Turkington) as he plays a string of dead-end shows in the middle of the Mojave desert. The Comedian is isolated and gradually spiralling into a breakdown which is further spurred by numerous disturbing events whilst touring. Penned by Alverson, Turkington and Tim Heidecker, Entertainment is essentially a study of isolation told in a bleak, sombre, and haunting style. The Comedian is a broken soul, with an unhappy life, who (barely) makes a living telling crude, vulgar jokes. The only human connection that he receives are normally incredibly disturbing (from a meeting with a woman in labour in a public toilet, to a bizarre encounter with Michael Cera's intimating junkie/rent-boy in another restroom). We see The Comedian attempt to keep up a relationship with his estranged daughter who never returns his calls. Alverson and co.'s screenplay straddles that bleak line between comedy and tragedy with truly haunting effect. The Comedian's isolation is paralleled through the vast, harsh Mojave setting. His performances are nearly consistently empty (despite hecklers or disgusted bystanders) and his daytime activities are usually basked in a grim emptiness - like visiting Aeroplane graveyards. Other than his disturbing Lynchian encounters in restrooms, the only consistent relationship that The Comedian has is with his loveable warm-up guy - a terrible Clown (Tye Sheridan) who audiences seem to embrace - yet Turkington's Comedian does not. This handsome, young buoyant performer marks a strong dichotomy to The Comedian, a man who is as physically repulsive as his material - thanks to a soaking greased combover and scabby tux, as well as a nasty habit of throat clearing on stage. Turkington injects this performance with aesthetic nastiness, but Alverson allows something undeniably sympathetic to creep through in this otherwise muted and tragic creation. With a bizarre and unsettled visual style, there is no real beauty in the desert setting which proves to barren and dry to entice. This bleakness further feeds into Entertainment's use of light and colour - a scene where The Comedian visits a chromotherapist gives Alverson's film a real unsettled visual palette. This unsettled quality transitions on to full-blown harrowing distress by the film's disturbing conclusion. Entertainment cannot be described as a pleasant watch. This is a feature that startles and unsettles consistently, with much to admire. It is somewhere between the best film ever made and the worst - but I'm strangely glad that I've seen it.